As part of INDEVCO’s strategy to spin off indevcoexport.com and provide comprehensive packaging portals for each of the 10 key sectors, the group has put online the final and largest packaging portal, INDEVCO food packaging portal. INDEVCO Group affiliates provide a large variety of products for wrapping bakery, pastry, condiment, confectionery, dry food, frozen, meat, poultry, seafood, seasoning and spice products. The user-friendly food packaging portal offers visitors easy access to in-depth information about corrugated packaging, paper materials, as well as plastic and composite films for the food sector. The portal offers a comprehensive sector-based brochure, as well as deep product-based information, including specifications and images, as well as illustrations showing the structure and materials used in some food packaging products. Interested parties can engage in live online chat with representatives available to help with inquiries. Food producers and packers, as well as meat producers, frozen food producers, bakeries and other food manufacturers can also request more information and request quotations, which will be processed by INDEVCO Lead Generation Unit. The portal keeps visitors in-tune with INDEVCO Group updates and developments by integrating social media channels through links to Twitter, LinkedIn, Facebook, and the group’s e-newsletter, OUTBOUND. Furthermore, the portal also lists upcoming events, names and locations of affiliates that produce food packaging products, and the various quality certifications affiliates have attained. With growing concerns for the environment, INDEVCO affiliates offer eco-friendly flexible and corrugated packaging safe for food contact, including the innovative recyclable wax-replacement corrugated boxes, GREENCOAT®. 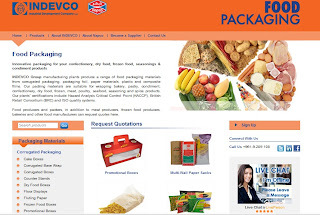 INDEVCO food packaging portal is powered by the Online Communications Unit, a service unit of INDEVCO Group.